We’ve made a real effort to have a couple of quieter days and have managed pretty well. Yesterday we weren’t away from our lovely holiday let until well after 10am. We’d decided to visit Raby Castle and on our way we stopped at the town of Bishop Auckland, an appealing town which was once the home of the Prince Bishops of Durham. A good walk around the town had us finding a new community art gallery where local artists are able to show their work. The standard of the work was pretty good and we reflected on how valuable such a space would be to us in Rangiora. Unfortunately I was not able to find out whether they were paying a lease for the space. Raby Castle is the home of Lord Barnard, and while, from the outside, it is a very large medieval castle dating from the 12th century, in part, the interior is a grand stately home with a vast traditional entrance boasting displays of stuffed game and weaponry. The great hall would have enclosed three or four of our house, in fact the room was so tall it it would have contained at least six or eight of our house if you stacked them. There were two magnificent drawing rooms the larger of which was a truly spectacular octagonal space with yellow silk wall covering, red drapes the most enormous chandelier and gilt fittings everywhere. The castle stands alone amongst mature trees in its deer park but has a walled garden separated from it by 200 metres or so. There were 20 or so people in our your group, a couple of nice children who were very well included by our guide, at one stage he was playing a game of table curling with them, of course there was the, rather posh, woman who wanted to know everything and would not keep up with the group. The castle tour took one and a half hours and lunch in the cafe along with a walk in the garden took our time there to more than three hours. A well worth while day! A wander around the town of Barnard Castle and a look at its ruined castle finished our day out. The day had been cold but we were pretty gob smacked to be hit by a dramatic hail storm along with thunder and lightning. This drove us into a cafe (unfortunately a Costas) but coming out after a good cup of tea the sun was shining again. Today we returned to Durham for the day visiting the lovely Crook Hall and gardens, a rather smaller establishment also dating from the 12th century. The house was fascinating but the cottage garden outshone it. I managed a couple of sketches before Paulette and I got lost in in the maze. Another wander around the river and up through the town took us back to the Cathedral which was much quieter and perhaps even more tranquil and reverential. We both climbed the tower, (325 steps) Paulette slightly reluctantly, our legs and breathing were fine and the view spectacular. Paulette was pleased to find that the top of the tower was a fairly enclosed. Back in the Market Place, which is sort of the centre of the city, I sat for most of an hour sketching while P wandered around the town doing a little shopping. Tonight we ate at a nearby pub “the Old Mill” where we got a good meal in a very nice environment. Today, our last in Coxhoe before we head for Scotland was another fairly quiet one. After doing our housework we headed off to Hartlepool to the Maritime Experience. It’s another themed museum based round the “Trincomalee” a naval frigate approaching 200 years old. 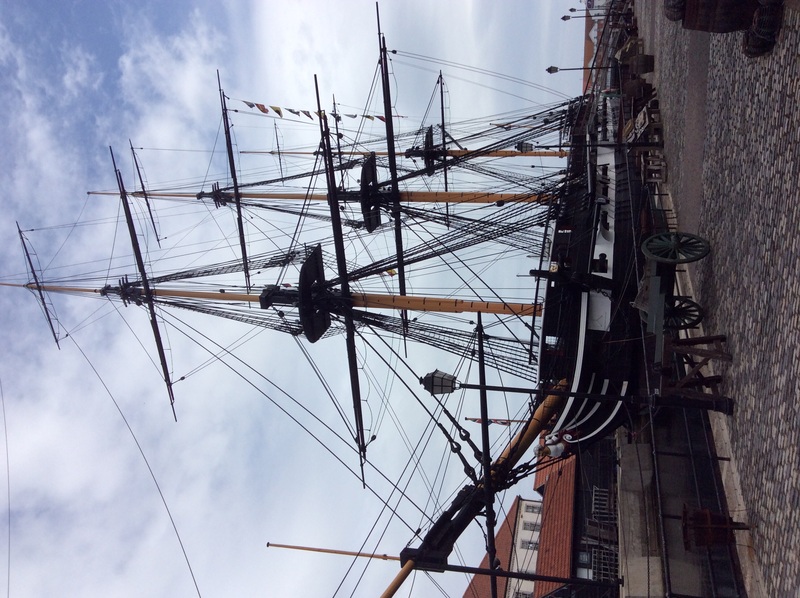 The ship was built for the English navy in India and served all around the world. For a largish square rigged sailing ship she is in excellent condition and sits floating in an enclosed dock. We were able to visit four decks and got a good idea of how it would have been to live on board. Below decks there was little headroom with each lower level getting more cramped. When the ship was in service it had a crew of over 300, officers and the ship surgeon had small, semi private, spaces but only the Captain had a grand cabin. Back on shore we toured a multimedia exhibition called Fighting Ships which tried to give the visitor some idea of how things would be on a ship in battle. We were also able to wander around a paddle steamer which was formerly used as a passenger ferry crossing the Humber. One of the girls in the museum suggested that we could walk around the marina area. The exercise was good and the day even warm at times, the marina is an inland dock area separated from the sea by two modern locks and must have been a bustling seaport before the ships got too big. The whole area has had a major renovation with bulk apartment blocks, modern shops and massive amounts of brick paving but is now looking uncared for with lots of rubbish and weeds growing up through the paving in places. We next drove the car a couple of miles to Hartlepool headland which was much nicer with a restored first war artillery battery, a lighthouse, beach with paddling pool and beautifully kept terrace houses. On our walk we found a pub where we had a very late lunch before returning to the car through the graveyard of St Hilda’s church. I am sorry that some of you are seeing our pics upside down. They are showing ok on my iPad, so I don’t quite know what to do. Enjoy Scotland. I’m so glad you’ve seen so much of Durham and had some good weather for it!